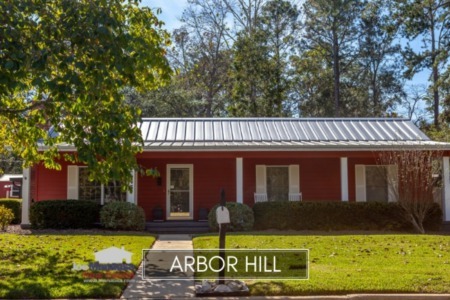 If you are looking for a great investment in a single family home, look no further than Arbor Hill, a neighborhood with excellent access to town and a premium location in Northeast Tallahassee. Situated on the southern border of Killearn Estates, this popular subdivision offers location, location, location and unbelievable prices. The value that recent buyers have picked up here is just boggles the mind, and whether they are investors or owner-occupants, they should have no concerns about their long-term rate of return on investment. 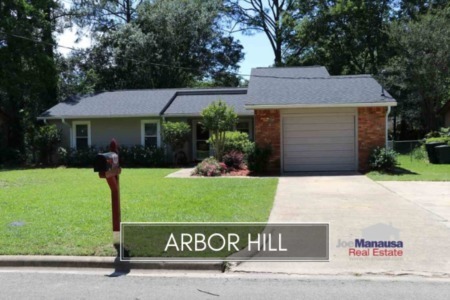 In this report, we will look at home prices, home values, and home sizes in Arbor Hill, as well as show current listings in the Tallahassee MLS and all closed home sales going back to 1991. For the three real estate graphs found below, you will find the number of closed home sales for each year (red columns, measured on the left vertical axis), and an important real estate statistic shown in blue (measured on the right vertical axis). It is important to note that the narrative contained below is for sales through December for all previous years, but through mid-month of August in 2015. The graphs and the closed sales table will be continuously updated into the future (meaning bookmark this page if you always want to know the current status of homes in Arbor Hill). Average home prices in Arbor Hill are phenomenal for home buyers, as they are still 31% lower than prices at the peak of the housing market in 2007. While much of this has been due to distressed sales, there are still great values on arms length homes as well. If you have been sitting on the fence about buying in Arbor Hill, I must warn you that this neighborhood has turned into a seller's market and you can be sure that prices will rise when sellers figure that out. Home sales activity is very low so far in 2015, expect that to change when sellers learn that higher prices are just around the corner. Average home values in Arbor Hill have not changed much since they hit a market low back in 2012. Needless to say, now is a great time to buy a home in Arbor Hill. As the final short sales and foreclosures become fewer, you can expect home values here to move to levels more reflective of such a great Northeast Tallahassee location. Through mid August of 2015, the average value of a home sold in Arbor Hill remains at $97 per square foot. This is about 40% cheaper than it would cost to build an equivalent sized home in the neighborhood, and this discount to cost is why I consider this area to be about the safest investment within the Tallahassee real estate market. The average home size sold in Arbor Hill typically falls in a range of 1,100 to 1,250 square feet, and 2015 so far has seen the smaller homes selling. The 9 home sales in 2015 have averaged 1,134 square feet, meaning recent buyers have been purchasing the smaller, less expensive homes. The following list of homes are the most recent listings in Arbor Hill. The following list shows home sales going back to 1991 in Arbor Hill. I hope you enjoyed our August 2015 update on home sales in Arbor Hill, please feel free to drop me a note if you have questions not covered in this report.